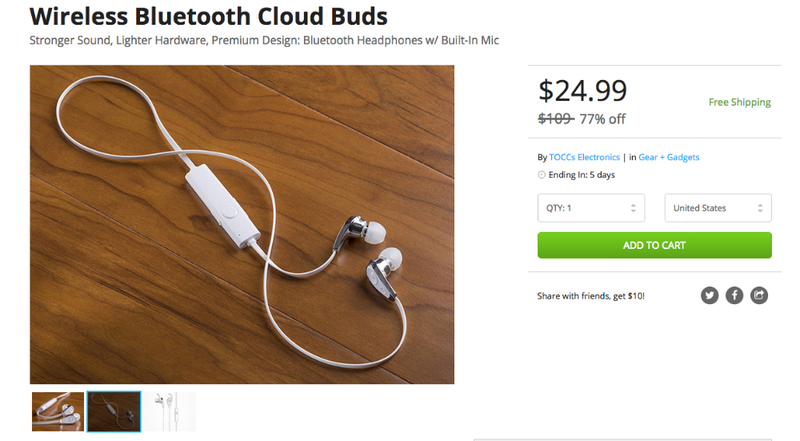 Happening on the DL Deals Store, you can grab a pair of wireless Bluetooth-powered Cloud Buds for just $25, marked down 77% from its MSRP of $109. Including free shipping, the Cloud Buds feature a noise-canceling outer shell, as well as a built-in microphone and remote for controlling audio playback. In addition, there are optional ear hooks, allowing you to safely secure the buds if you are taking a run or working out in the gym. Naturally, multiple sized of gelled ear buds and caps are included, giving you the perfect fit no matter the size of your ears. If you need some well priced bluetooth music buds, follow the link below.